Stay on Marsh until you reach Broad St. 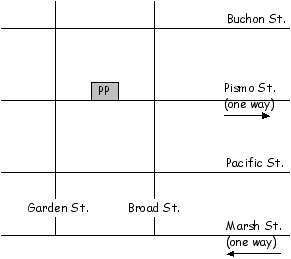 Turn right on Broad (past Pacific, Pismo) to Buchon. Turn left on Buchon St. Buchon will hit Garden. Turn left on Garden St.
Park on Garden and walk to Planned Parenthood on Pismo St. Walk with signs on opposite side of street of PP, if there are people who are strictly praying in front of the PP building. Walk with signs in front of PP only if people with signs are present.